Under the Never Sky has quickly become one of my favorite books ever. 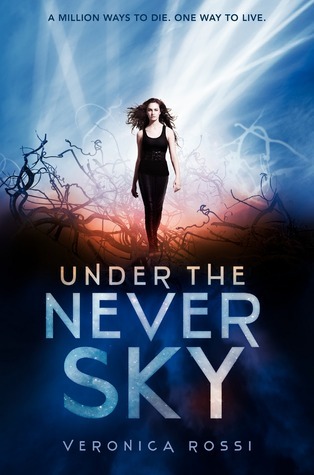 Veronica Rossi has completely awed me with her futuristic dystopian novel; which is filled with non-stop adventure, love, self-discovery and a plot rich with characters that are impossible not to fall in love with! It's intense, funny, sometimes hostile, and also beautiful. This is a book that continued to stick with me long after I finished it. The world that Veronica Rossi has created is so extraordinary and original. It's a world where there are dangerous Aether storms that have destroyed populations, which have ultimately forced people to separate into two categories: Outsiders and Dwellers. Outsiders are those who live unsheltered from the Aether and they are very strong and primal individuals. Survival is their main focus. Whereas the Dwellers thrive in different indoor communities/pods where they have advanced technology and live a pretty comfortable but naive life. The characters all have their own distinct signatures, and I can honestly say that I've never come across characters like Aria and Perry. The story is told through their perspectives and this really enabled me to form a stronger connection to them. Aria and Perry come from completely different environments; Aria is a dweller who was born and raised in a closed off/safe environment; while Perry is an Outsider, A.K.A. Savage, who has lived with his tribe all of his life where they are exposed to the Aether and the many other dangers lurking about. Aria and Perry are surprised to find themselves thrust together by a series of devastating events. These two are both struggling with very different situations but they end up working together and needing eachother more than they thought. The progression of their relationship was so well done, and I absolutely loved how it went through various stages; they go from simply tolerating eachother to forming such a beautiful and unexpected bond/romance. They really seem to make eachother stronger. The secondary characters are definitely worth mentioning as well, and I especially got such a kick out of Perry's childhood friend, Roar. He's just plain funny and awesome, and I definitely wouldn't mind a healthy dose of him in the next book! I also took quite a liking to Cinder, the boy that we come across during Aria and Perry's journey. He is a giant mystery if I ever saw one! Plus there's Marron, who is a pretty helpful and generous guy. There's just something about him that is so likable. There's also paranormal aspects to this novel that I wasn't quite expecting, but I totally dig them all and they fit into the story so well. I'm sure the next book (Through the Ever Night) will expand on them and I can't wait for more to be revealed. Getting wrapped up in the world of Aria and Perry again will be such a treat! Great review! I felt the same way about this book...actually I couldn't stop raving about it after I read it, and I did that in one sitting. Really looking forward to Through the Ever Night.